Back in November China’s TENAA certified the upcoming LeEco Le X850 for sale in the country, though it still hasn’t launched. And now it looks like the same handset (or a slightly different version of it) was put through the paces of GFXBench, which as usual has resulted in a pretty complete listing of its specs on the benchmark’s website. The phone’s model number is said to be X85x, and the second “x” could obviously stand for “0”. Then again, GFXBench also calls it X10 as if that may be its name, so it’s unclear what’s going on here. Finally note that there are some small differences between the specs outed by TENAA for the X850 and what GFXBench lists for the X10/X85x. The Chinese regulatory authority spoke of a device with a 5.7-inch QHD screen, Snapdragon 821 chipset, 4GB of RAM, 64GB of storage, dual 13 MP rear cameras, and a 16 MP selfie snapper. 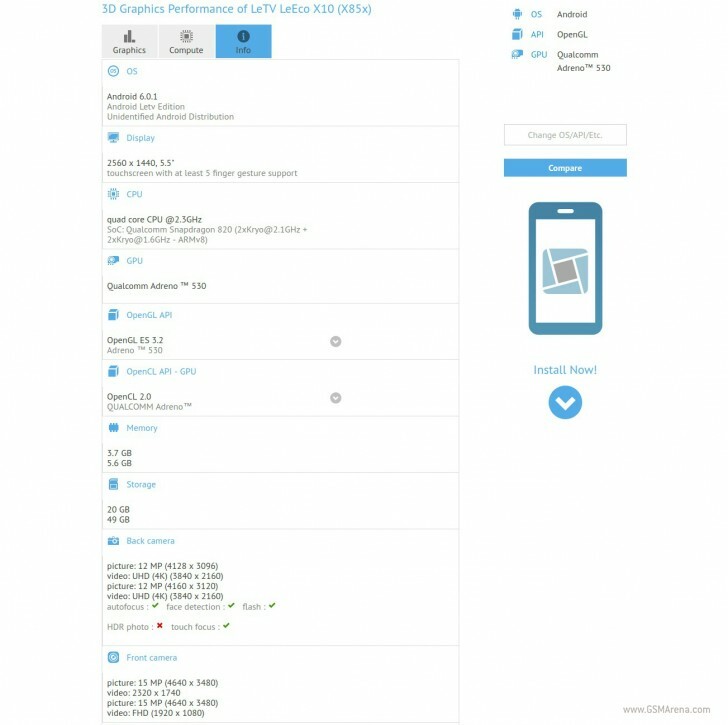 GFXBench says it has a 5.5-inch QHD display, the Snapdragon 820 at the helm, 4 or 6GB of RAM, 32 or 64GB of storage, a 12 MP + 12 MP dual rear camera setup (with 4K video recording), and surprisingly a 16 MP + 16 MP dual front camera arrangement too. Four camera sensors on one device are apparently becoming mainstream this year. There’s still no telling when the LeEco X850 / X10 / X85x will finally be outed, but hopefully that will happen soon. And with MWC practically right around the corner, it could be that LeEco is waiting for that particular setting for its grand unveiling.